Many carnivores are difficult and labour-intensive to detect, often leading to prohibitively high effort and cost in large-scale surveys. However, such studies provide Information that is Important for effective management and conservation. Here, we evaluate the suitability of three survey methods for landscape-scale multi-species monitoring. We compare sign surveys, spotlighting, and audio playbacks in terms of detection efficiency, precision, effort, and cost. Sign surveys out-performed the other methods in all comparison criteria, although supplementary methods were needed for some species and sites. We found that using established analysis techniques, robust landscape-scale abundance estimates would require unrealistically high effort and cost. Occupancy estimation required considerably lower sample sizes and was therefore more economical. 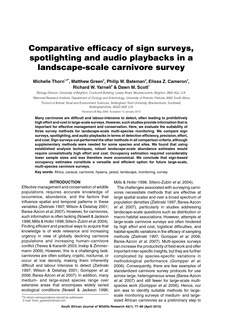 We conclude that sign-based occupancy estimates constitute a versatile and efficient option for future large-scale, multi-species carnivore surveys.